Secret Cinema can finally lift the curtain on their latest immersive production. Stanley Kubrick’s 1964 cinematic masterpiece and political comedy: Dr. Strangelove or: How I Learned to Stop Worrying and Love the Bomb starring Peter Sellers, was resurrected, and with it a call to engage in a new social movement. Secret Cinema’s Tell No One production, the first since their hugely successful Secret Cinema presents Star Wars: The Empire Strikes Back in 2015, was a homage and a return to its underground roots where the film is not revealed to the audience until the night. Drawing inspiration from Kubrick himself, and current world affairs, the production confronted modern social anxieties and blurred the lines between real and fictional worlds. The journey beginning for the audience when they were assigned their unique persona at the D.O.C.S. website (Department of Cultural Surveillance) usdocs.co password: accessdocs. Whether they were Military Division or Diplomat, all ticket holders were encouraged to get involved in the new world, with even a fictional newspaper (washingtontelegraph.co) encouraging participants to become citizen journalists. Reporting to duty on the night at the fictional Burpelson Air Base, created at an abandoned factory warehouse complex in South London, the film was brought to life with over 35 actors posing as D.O.C.S. 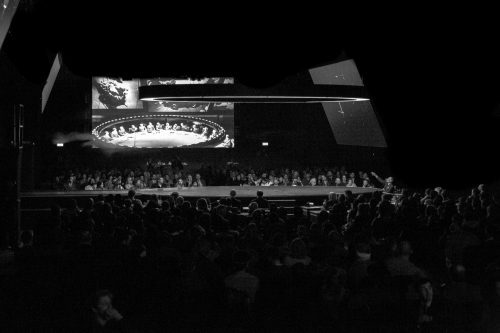 personnel, military and non-military, a live jazz band, and a life-size replica of the iconic War Room, created by set design legend Ken Adam, who sadly passed away in the course of the last month. This was built to a grand scale, and incorporated six stadium-sized screens from where the audience could watch world events unfold. Active engagement was encouraged, and in an attempt to bridge the gap between the citizen and political class, audience members were invited to stand up to world leaders within the show. The Tell No One production gave its ticket holders the opportunity to deliberate on the threat of nuclear warfare, an issue that whilst laying buried, is still a real threat today. Secret Cinema Tell No One featuring Dr. Strangelove or: How I Learned to Stop Worrying and Love the Bomb ran from 17th February until 20th March. The event was in support of War Child UK.